I slept like a log. I think the butter before bed is helping, I’ll repeat tonight. I woke up again earlier then usual and I felt rested. Today I had some pain in my left knee. I think fish oil is essential for me to keep inflammation down. I’ll be taking fish oil to see if it will make a difference tomorrow. I felt a bit hungry today. I suspect that I am slowly depleting my glycogen stores instead of burning mostly fat. It means am not fully keto-adapted yet. One of the greatest benefit of keto-adaptation is freedom from hunger and snacking; your body seamlessly switch from burning dietary fat to body fat without much hunger signaling. Today I had: 1 Tbs of coconut oil and 2 Tbs of butter in a coffee in the morning and 2 Tbs of coconut oil in the afternoon. Dinner consisted of lobster with garlic clarified butter/olive oil mix, some romaine as a side salad, with sardines and 3 Tbs of olive oil in a homemade dressing. Before bed I’ll have 1 Tbs of butter with fish oil. It’s about 2000 calories for the day. Lobster with garlic butter, mmmmm! As a general rule the short and medium lengths are metabolized quickly and easily by the body; they will be diffused from the GI tract to the portal venous system, fed to your good gut bacteria or they will kill bad ones. This is why I use butter and coconut oil during the day for energy and gut health. Long chain fatty acids (like olive oil, Omega-3, Omega-6) need more work and processies to be used as fuel and are preferably used for maintenance, repair (this is why they have such great health benefits) or are stored if we are in a calorie surplus. The fat we store for future energy use is a mix of about 50/50 monounsaturated and saturated fat. It is the preferd type of fuel at the perfect ratio. Polyunsaturated fat are essential fat (they act more like vitamins) but they make poor fuel source for the body. Too much polyunsaturated fat as a percentage of calories on a well designed ketogenic diet is detrimental for many reasons. Sometimes I see people not reacting well to lower carbohydrate/ketogenic diet only because they eat a lot polyunsaturated fat sources like commercially available mayonnaise made with soybean oil. It is too much polyunsaturated fat to feel well! It’s better to make our own, with a light tasting olive oil or, less idealy, to buy commercially available mayaonnaise made with an olive oil/canola blend. An equal quantity of olive oil and butter mix together would be very close to what is in our fat storage. The same goes for animal fat. Bacon, for instance, has a perfect 50/50 blend of monounsaturated/saturated fat. Most fat sources are a combination of different length and double bond in the carbon chain. In the context of a well designed ketogenic diet, where fat is the main source of fuel for the body: it’s important to keep an eye on the amount of polyunsaturated fat consumed (which is as little as possible Omega 6), correct the Omega-3/Omega-6 ratio with supplements and aim for the equal amount of monounsaturated fat and saturated fat. Also staying away from Trans fatty acids found in: food fried in vegetable oil, margarine, vegetable shortening and anything that says partially hydrogenated oils on its label, is a general rule for any healthy diet, independently of its macronutrient combination. The last point I want to make is about storing and cooking oil and/or fat. Fat is altered by heat, light, humidity and oxygen. Saturated fat is the most stable, then monounsaturated and lastly the most delicate is polyunsaturated. Heat oxidation and rancidity are major issues for any fats. You should know the smoke point (burning point) and ideal storage conditions of the oil/fat you are using. For instance, we should never fry/stir-fry extra-virgin olive oil. Its smoke point is very low (375°F) and heat destroys all the health benefits and denatures the fatty acids. If you want to use olive oil for cooking, it is better and cheaper to use extra light olive oil (468°F) and ghee (485°F) instead of butter (250°F). Olive oil can be kept at room temperature for up to a year after its production date. If you buy in bulk, you should keep the big container in a cool place or the fridge and keep a small refillable bottle in the pantry. Raw nuts and seeds, rich in polyunsaturated fat are best kept in the fridge and will stay good for a year after it’s picked (sometimes you eat a nut and you can taste the rancidity, it’s bad!) Ghee can be kept at room temperature up to 3 months and salted butter a couple of days (unsalted butter cannot be kept at room temperature because there is no salt to protect it from molds and bacteria). If you like soft butter, a good tip is to make a 60/40 or 50/50 butter-oil mix and keep it in the fridge. It will have the consistency of a spread or margarine. You can use light olive or canola oil to preserve the taste of butter. Not many things pains me as much as seeing a person who is suffering from severe acne. Even if it is consider a benign condition by the medical establishment, only someone afflicted with it can understand the deep social and psychological impact it can have on someone’s life. I am one of them. I have used every product, tried every program but I only saw dramatic and lasting results once I gave up on the quest to find the miracle cream or pill and realized that there was no quick fix. The skin is a window into our overall health, and acne is a sign that something isn’t working as well as it should. Cut out the worst offenders: sugar containing beverages like soft drinks, sport drinks, energy drinks, fruit punch, etc. are all inflammatory and put a burden on your elimination system. For someone who is predispose to skin problems, it makes things worst, period. Drinking enough water and maybe some green tea, is a must to make sure you stay hydrated and that you flush out toxins efficiently. The juice of half a lemon (freshly squeeze is best), in a cup of warm water, perhaps with a pinch of salt, first thing in the morning is a great and gentle way to encourage liver and digestive system detoxification, among other things. Eat an adequate protein diet, with a low-glycemic load and plenty of good fats with a proper Omega-3 : Omega-6 ratio. Once again, we want to quell inflammation. Roller coaster of insulin wreak havoc on our system and makes skin problems worst. In many cases, the stabilization of blood sugar, leads to a major improvement in skin’s feel and appearance. We want most of our meals to be composed of: a quality protein, some non-starch veggies, some lower glycemic starches and good fat like olive oil, flax meal, avocado (guacamole), ghee / grass-fed butter, some nuts etc. The protein and fats will provide what we need to build, heal and repair. The fats, veggies and starches will help us with elimination (proper bowel function is extremely important) and hormonal balance. Consider implementing a basic supplement regiment composed of: a Complete Multi-vitamin and Mineral and Fish oil (for skin health, I like cod liver oil with its naturally occurring extra Vitamin A and D, 10:1 ratio). Some extra Vitamin C, probiotic and especially Zinc (25-50g/day of citrate or picolinate), can also help, if you wish to add them. Stress, cortisol and poor adrenal functions affect your skin, be mindful of it. Sufficient good quality sleep, lowering our caffeine consumption and the implementation of stress coping strategies, can have a surprising effect on the level of inflammation in our skin. Do not use harsh products on already inflamed skin, it makes it worst. Take an Epsom salt / baking soda bath, 2-3 times a week to help your skin and body detox and use gentle cleaner only. Give yourself time. It takes about 4 to 6 weeks for the new cells to reach the surface of the skin. Don’t give up too soon! Implement the changes slowly, but make them permanent. Not only will you have better skin, but your overall health will benefit. If you are still struggling after a couple of months, consider that you might have a food allergy or sensitivity. An Elimination Diet would be worth trying. Once most sugar is eliminated, the most common offenders are dairies and gluten/grains (also oranges and grapefruits to a lesser extent). Should we pass on Nuts? Nuts are fairly high in Linoleic Acid, an Omega-6 inflammatory precursor, with a few exceptions like macadamia nuts which are lower. A diet high in nuts, would presumably skew the Omega-3 : Omega-6 ratio toward pro-inflammatory processes. But nuts should not make up the bulk of our diet. On the spectrum of inflammation and Omega-6, a small handful of raw or lightly roasted nuts is nothing compare to stir-frying or baking with corn, grapeseed, margarine or soybean oil. Nuts are much more than Linoleic Acid. In fact, they are pretty complete nutritional source. They have a good balance of fat/carbohydrate + fiber/protein, have a low impact on blood sugar, are a great source of antioxidants like Vitamin E and important minerals like selenium and magnesium. 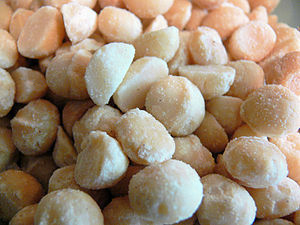 Actually, one of my favorite snack or dessert is a dozen of macadamia nuts, a square of dark chocolate and a green tea with a squeeze of lemon or coffee with a dash of cinnamon. “Don’t let the perfect be the enemy of the good.” Voltaire. There are definitely better choices in every food categories, but over-analyzing our food intake is a good way to stress ourselves and make every little dietary decision an internal struggle. We have to stay informed and vigilant, but we have to pick our battles. Using healthier options like good quality olive or coconut oil preparing our food or passing on the box of donuts at the office is worth the effort; stressing over the Omega-6 content of 10 almonds is not. Understanding Omega-3 and Omega-6 pathways; how it could change your life. Omega-3 and omega-6 are types of essential fatty acids i.e. we cannot produce it in our bodies and have to obtain them from our diet. Omegas are the building blocks for hormones, it control immune function, blood clotting, and cell growth as well as being components of cell membranes. In our modern diet, there is hardly any good source of omega-3 fatty acids, except wild fatty fish. By contrast, sources of omega-6 fatty acids are abundant. Our diet, which is rich in commercially farmed animal product and polyunsaturated vegetable oils will causes an omega 3 deficiency. The simplified pathway graph below will help us understand what is happening in the body. Omega-3 and omega-6 simplified pathway. The boxes named ALA and LA represent omega precursors. Precursors are building blocks from vegetable origin. The body cannot convert and use them without the help of the enzymes ∆6 and ∆5 desaturase. Let’s say we eat a piece of multigrain toast that contains flax and corn. Our body will make the enzymes and indiscriminately convert the ALA in EPA, then DHA and the LA in AA. If we eat as much of one as the other, we will have approximately a 1:1 ratio output. We’ll be in a balance of anti-inflammatory vs. inflammatory factors i.e. life is good! But if we put peanut butter on our toast, we get in trouble! Peanuts have a 5162 : 1 LA to ALA ratio, meaning it will skew the balance in the favor of AA, resulting in inflammation in the body. This is why we hear so much about the importance of taking fish oil. It is speculated that a couple of capsule of fish oil a day would counteract the overwhelming amount of omega-6 and omega-6 precursor we consume in our modern diet. But is that so? The omegas in fish oil are directly available to us, because it has already been transformed fish, from ALA in phytoplankton, to EPA and DHA. Simply put, EPA would be the antagonist of AA. EPA counteracts the inflammatory action of AA found in commercially farmed beef, chicken, eggs, pork, and dairies, as well as the AA produced from excess LA found in most of our foods like vegetable oil, margarine, grains, nuts, seeds and so on. DHA has more of a structural function, is the most abundant fat in the brain and is a large contributor to brain growth. Oxidative damage that comes with age diminishes DHA concentrations in brain cell membrane, and is linked with its degenerescence. The important benefits of fish oil on moods and attention disorders is often attributed to DHA. AA is not a bad guy. We need AA, it is an essential component in membranes of our body’s cells, and it is abundant in the brain, the muscles and the liver. The problem is that we do not have the right balance in our modern diet. To function optimally, we should keep a ratio of 1 : 1 O-3 to O-6. If you have been eating more O-6 to O-3 in your diet (everybody raise their hand), a 2-3 : 1 ratio in favor of omega 3 would be more appropriate to correct the overabundance of omega-6 already in our body. It is pretty discouraging and almost unrealistic to achieve this, in the context of our modern life. Beware of misinformation, even from reputable sources! We always have to keep and mind that we are looking at for high sources of ALA/O-3 AND a favorable ratio. O3:O6 ratio: 2.5:1 = anti-inflammation = good! O3:O6 ratio: 14:1 = anti-inflammation = best! It’s definitely worth to take some time to do our research! Once we have the tool to make better choices for ourselves, we can add helpful supplements, if we wish to. I use a two prongs approach. Using Chia seeds, Flax seed meal and Flax seed oil as a source of ALA. Using good quality Fish oil as a source of EPA and DHA. Most people agree on taking the Fish oil but some frown on flax. The argument is that fish oil is superior to flax because the ALA in flax need to be converted by our enzymes in EPA and DHA. So it make sense to think that 1 g of fish oil would be more potent than 1 g of flax oil. It sounds logical but I still take flax with my fish oil! My logic behind using flax, besides being very beneficial for PCOS, is that I want to make sure I provide some ALA to compete with the LA for the attention of my enzymes ∆6 and ∆5 desaturase. I speculate that if my intake of ALA is very low compare to my LA, my enzymes we’ll be busy pumping out a huge amount of AA into my system. A higher intake of ALA would slow down the output of AA and augment the circulating O-3 in my system. Then I take my fish oil to balanced the rest of the AA. Without getting too technical, I get noticeable benefits from each independently and I feel they even work better when they are taken together. The key is always to balance one, with the other. Fish oil, at the right dosage, does wonder on insulin sensitivity, mood and energy. If I’m traveling and I forget my supplement, there is a noticeable change it my mood within days. Almost everybody can benefit from this key supplement!